Disclosure: This is a compensated post with Gourmet Garden, making NJB awesomeness possible. As usual all opinions are my own. Don’t you love the movie Ratatouille? I love love love it. I have watched it a billion times, and always listen to the crunch of bread before buying a loaf. I am super nostalgic like that, as a chef. I was in Pairs all alone, by choice :), roaming the streets, eating croissants daily, baguettes torn straight from the top as I walked, and an occasional casual street cafe meal. This was ten years ago, less money, and inhibition. I ate everything. I treated myself to one nice meal, while another was treated by a complete stranger. It was a safe situation and pretty awesome. We met on the train from Nice to Paris, he was a film maker returning to Paris from the Cannes Film Festival. I always meet interesting people. He sparked the conversation per the book I was reading, I obliged, we ate, and said good-bye, so Paris. Watching films, albeit even animated ones like Ratatouille, bring back the memories, smells, and nostalgia of that trip. The days, and countless hours spent at the Louve, D’Orsay, and hidden gem of a house filled with rare art from Monet’s Water Lily, Cézanne, Matisse, Modigliani, Picasso, Renoir, Rousseau, Sisley and Utrillo. It was glorious, just as sweet and tasty as the food I ate, and feelings I felt. I wrote everyday in my journal, and walked until midnight most every night, stopping for the corner shop nutella filled crepe for dessert. Bliss. The movie, Ratatouille, was written so that we could taste, and feel the passion from the rat cooking the food. And when they made the peasants dish, which is Ratatouille, I was in heaven. I made it at home immediately. It is the perfect one pan dish served with a chunk of good bread dipped in the bowl of lightly cooked vegetables, a dream come true. Super savory from the Gourmet Garden organic herbs, and slightly sweet from the tomatoes, the perfect combination. Making this dish brings Paris to my heart, and reminds me of the subtle hints in the movie as to why I became a chef. I love good food. I was going to make it look just like the one in the movie. If you haven’t seen it, the vegetables are thinly sliced, placed perfectly in an oval dish, and served in a tower of those thinly sliced vegetables. Yet the origin, and flash back of the dish is far more my style. 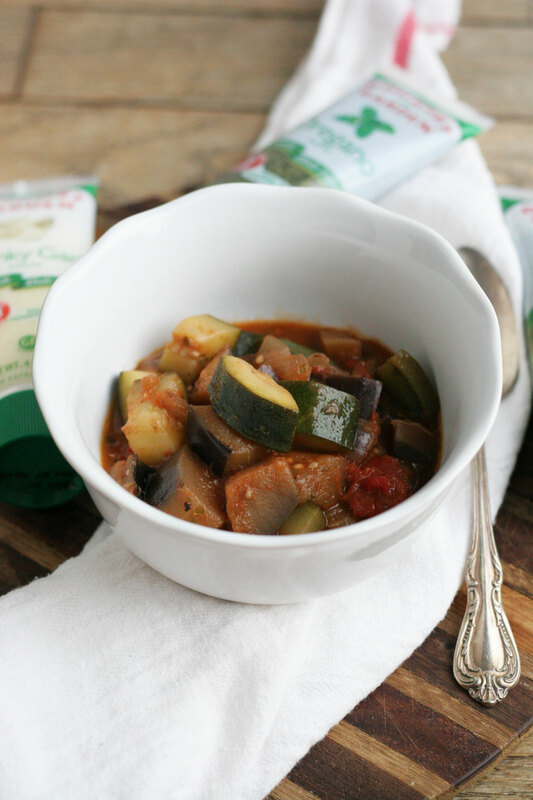 Chopped eggplant, zucchini, and tomatoes cooked in a Dutch oven or large pot, served in a bowl, spoon in hand, bread in other hand. Casual, delicious comfort food. So I went that route so that it also is more approachable to make. I hope you like it! As it’s the last days of Summer, this will likely be the last Summer dish I make for the blog, which is just right. Celebrating the last of Summer’s bounty, and the last drop of the juicy tomatoes! While this is the epitome a of Summer’s dish, you could also can some tomatoes and use them for this dish in the dead of Winter to warm you up. And the great thing about the Gourmet Garden herbs, you can keep them in your freezer all year long for on hand herb goodness and convenience! 1. In a large Dutch oven, or pot, add olive oil, and onions, cook for 5 minutes, stirring occasionally. Add eggplant, cook for 5 minutes, or until slightly golden brown. Add zucchini, bell peppers, garlic, basil, and oregano, stir. Cook for another 5 minutes. 2. Add red wine, using a spoon, scrape the brown bits off the bottom of the pot. Add tomatoes, salt, and pepper. Stir to combine. Cook for 10-15 minutes. Taste for seasoning. Serve family style with thick slices of good bread. Store in an airtight container for up to 3 days. Great for work leftovers and potlucks! Love the movie and LOVE gourmet garden – the perfect pairing! Love the move and LOVE gourmet garden – the perfect pairing! Gourmet Garden is my favorite! I LOVE their garlic and ginger. 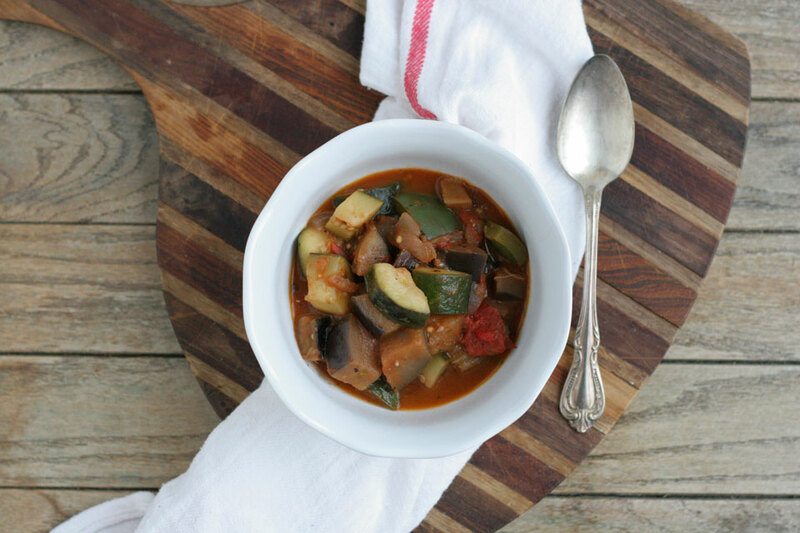 Plus it’s a perfect use for this ratatouille. BTW I have never seen that movie but I think that needs to change! You totally have to watch that movie and report back lol! I love it so much. I’m a huge fan of Ratatouille! I’m a huge fan of Gourmet Gardens! Put them together and it’s just perfect…why didn’t I ever think of this. Brilliant. Me too! I keep them in my freezer to last longer. Thank you, Jenny! 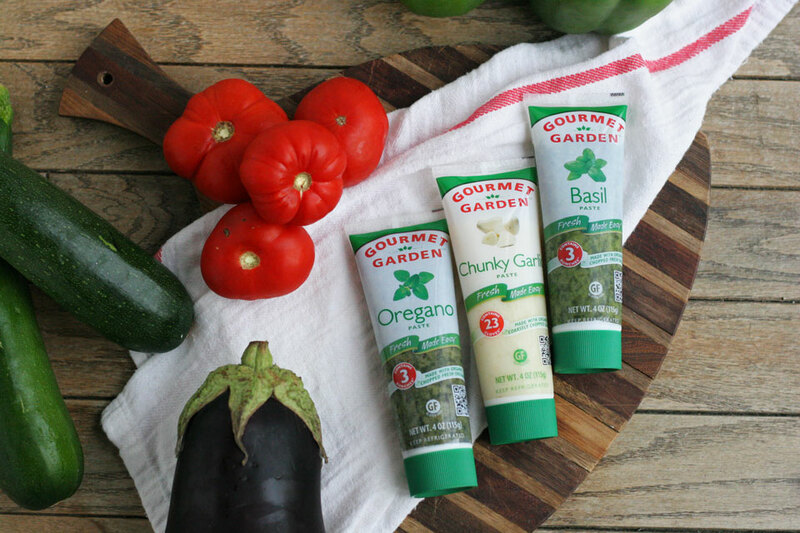 Gourmet Gardens is one of my favorite products I have in my kitchen. I love how easy convenient and flavorful they are to use. And I absolutely love this recipe. Great use of their product! Thank you, Kristen! I could not agree more. I love the chunky garlic in this one, it was so easy. 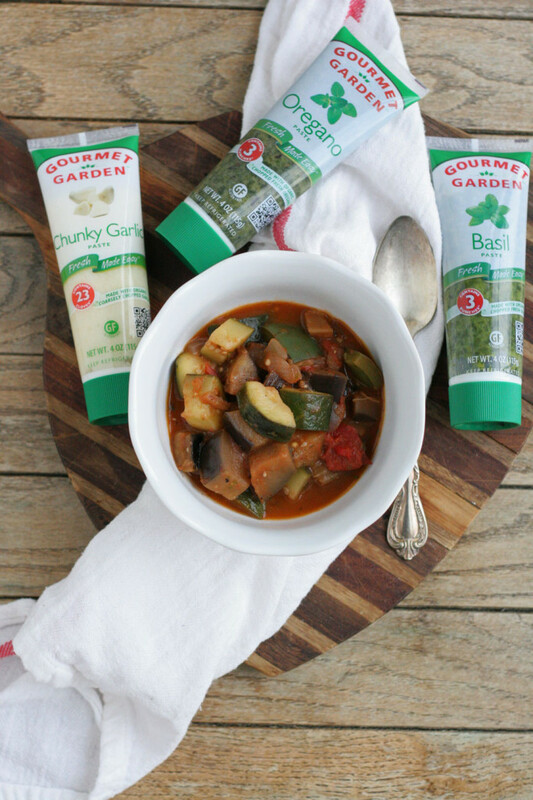 I love the Gourmet Garden products – I use their ginger all the time! Great dish to incorporate all 3 into. Thank you, Amy! I love their ginger too.